← Is This the Flu… or Is a Portal Opening Up? ITC… or Magic… or God… What Spiritual Path Is for Me? As a firm believer in reincarnation, I can’t imagine that I have ever, in any of my other many lifetimes, had the opportunity to explore more deeply into the true nature of humanity on Earth… our ancient past and our rich spiritual heritage… than I’ve been allowed in this lifetime. Year by year, life’s many puzzles are slowly being solved, one after another. One puzzle that came together clearly in the past few weeks (while I was grappling with the flu) is that there are two spirit realms, in particular, which exert a lot of influence over our lives here on Earth. Or, more accurately, there are two spirit realms that share a lot of give and take… push and pull… with humanity in our world. 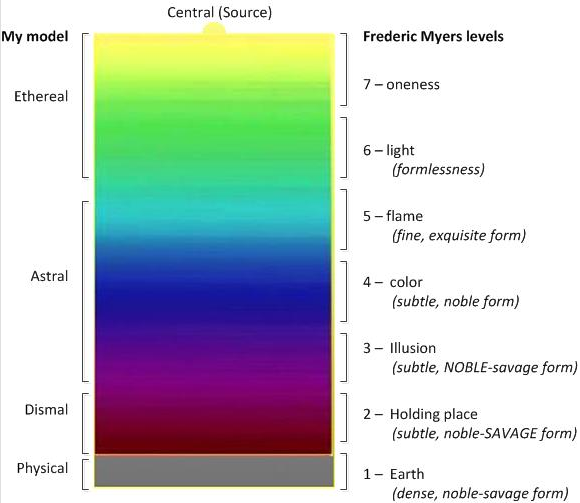 Those are spirit levels 2 and 3, according to the Frederic Myers model. For this article, I’ve made some small adjustments to this diagram that I’ve borrowed from the Spirit Reality page of this website. You can see that levels 2 and 3 are very similar to this noble-savage Earth (level 1). Level 2 leans a bit toward the savage, and level 3 leans more toward the noble. From what I’ve observed in my dreams and meditations (as well as from ITC contacts describing life on level 3), I think it’s fair to say that level 2 is a rather dark and dismal version of Earth, and level 3 is a rather light and upbeat version of Earth. Human communities in both realms are very similar to human communities on Earth. Level 3 is the threshold to the heavenly paradise that exists at levels 4 and 5, where the savage aspects of human nature have been polished away completely, like tarnish from silver. Level 2, I believe, is the threshold to parallel material universes… as well as a spiritual holding place for people who veered off a bit into the savage side of life before they died. It’s a dense spirit realm that starts to blend into subtle material realms. I believe that some of those parallel material universes, some of which are of subtler vibration than our own material universe, are inhabited by various kinds of alien cultures, such as the “reptilians” and “greys.” So level 2 becomes a very strange mix of alien and somewhat tarnished human influences… if that makes sense. Why do those two spirit worlds in particular share a mutual influence with us humans on Earth? They are the two realms that have most in common with our world. The spirits residing in those realms are most similar to us humans on Earth in terms of their attitudes, understanding, and feelings toward each other. As I’ve mentioned in other articles, the diverse thought forms generated by us humans on Earth are split apart, as though by a prism, as they stream into the worlds of spirit. The thought forms are pulled to spirit realms where they resonate. Love and wisdom, which we feel during those rare moments of inspiration and bliss, stream into the finer spirit realms (levels 5, 6, and 7 of the Myers model). Our understanding and appreciation of this three-dimensional reality of time and space, and our fascination with other humans… all of those rather pleasant worldly thoughts stream into level 3 to influence the structures and life styles in that realm. Our fear, confusion, animosity, and suspicion toward life and toward other people stream into level 2. At these moments of connection with the various realms, apparently two-way communication opens up, so that information can flow to receptive minds both on Earth and in that particular spirit realm. Why don’t those finer realms (levels 5, 6, and 7) have more direct influence on our world? Few of us humans live our lives, day in and day out, steeped in love and wisdom. There are too many inconsiderate drivers and pushy salesmen and gossip-mongers and crooks in the world (not the mention the many dramas in books, magazines, TV shows, and movies incessantly stirring our hormones) to let us enjoy a perpetual state of bliss during these lifetimes on Earth. We tend to get pulled into life’s dramas everyday… to get annoyed or stimulated often, as a matter of course, here on Earth. For that reason, the finer spirit realms can’t exert a lot of direct influence on our world. The perpetual love and peace of those finer realms don’t resonate with the dramas of this world. We are noble-savage human beings. Some of us lean more toward the noble side, and others more toward the savage side… but we’re all noble-savage by nature. The fact is, we all host a soul or finer spirit deep within, which makes us all, primarily, a noble being steeped in love, honesty, sincerity, trust, empathy, and good will. The fact is, we all have this carnal shell, or physical body, driven largely by hormones and ego, which compel us toward fear, deception, suspicion, animosity, and revenge. It’s this noble-savage mixture of forces within us that keeps us bound, for the most part, to spirit levels 3 and 2. If we lean a little more toward the noble side, then we resonate with Level 3. If we lean a little more toward the savage side, then we resonate with level 2. It doesn’t take much influence to pull us one way or the other. It’s common for any one of us to be pulled more toward level 2 or level 3 at various points in our lives… simply because of our noble-savage nature as human beings. A period of excessive drinking, drugging, and carousing can pull us toward level 2. A period of soul-searching, prayer, and meditation can pull us toward level 3. Most of us live our earthly lives on the border between spirit level 2 and spirit level 3. ITC (instrumental transcommunication) is anchored at level 3. Researchers on Earth establish a contact field with spirit groups at level 3, and a communication bridge is established through which the spirit team can begin to convey information through the technologies of their earthside collaborators. ITC can only work at level 3. Spirits at level 3 are enough like humans on Earth to resonate with our thoughts, feelings, and attitudes. Spirits at level 3 lean enough toward the noble side to allow an adequate amount of trust and good will to provide a stable, clear contact field. It’s a very fragile situation, however… that contact field. As long as the spirit group at level 3 and the earthside human experimenters can all lean toward the noble (that is, they remain bonded by trust, honesty, and good will), then the contact field remains stable and clear. If any of the members start to give in to their savage side (being overcome by fear or suspicion or deception or resentment), then the contact field becomes murky and unstable. At that point, we lose touch with our invisible friends at level 3. Spirits at level 2 can break into the bridge, and communications can be disrupted… tarnished. Why can’t ITC work at spirit levels 4 or 5 or 6? Humans on Earth are too susceptible to their savage sides… they are too tarnished emotionally and spiritually to resonate with the spirits at those finer levels. A communication bridge between Earth and those finer spirit levels could be sustained only if the humans were cloistered in a drama-free environment where personality conflicts did not exist… where everyone felt complete, unwavering love, trust, and good will toward one another. Such a condition cannot exist among noble-savage humans on Earth for any length of time… in my experience. Even nuns in convents and monks in monasteries probably get irked with each other from time to time. They’re only human. It can only work when the vibrations of those present are in complete harmony, and when their aims and intentions are pure. The savage-leaning dispositions of residents at spirit level 2 (I believe) make it impossible to sustain a working communication bridge with the Earth. There’s no way to sustain complete harmony and pure intentions at spirit level 2. Savage projects and organizations, whether at spirit level 2 or here on Earth, inevitably fall apart amid chaos and conflict. While projects such as ITC require a condition of harmony and pure intentions that can’t be sustained at spirit level 2, there are other kinds of projects that can and do occur between Earth and level 2. Crop circles (read more here… and here…). I guess we all have to ask ourselves… where do I want to be in this big scenario of spiritual realms and parallel material universes all superimposed over my world? Do I want to remain steeped in this life on Earth and oblivious to the vast, invisible realms flourishing with life around me? Do I want to stay anchored in the only truth… the only reality… God, the Central Source… and let the illusions of all the other realms (including Earth) play out around me without affecting me too much? Do I want to interact with the beings (spirits, aliens, and other intelligent life forms) inhabiting spirit levels 2 and 3? Do I want to meditate with light beings, angels, and ethereals in the finer realms of spirit? These are the kinds of questions that I suppose we need to ask ourselves as we chart a spiritual course for ourselves during our lifetimes on Earth. They’re the types of questions I’ve been asking myself for the past several weeks… and here’s what I’ve come up with. I want to stay anchored in God, with the underlying knowledge that everything else… all of the structures and thoughts and entities throughout the various spiritual and material realms… everything other than God is illusion. That knowledge can bring the greatest peace of mind during the inevitable times of suffering and grief here on Earth. My soul is part of God’s central reality and is the only real part of me; everything else about me, especially this carnal body and mind, is part of the illusion. I remain firmly committed to ITC… establishing stable communication bridges with spirit level 3. That’s what I hope to support and promote for the rest of my life… (along with the acknowledgement of God as the only truth, of course). Before I meditate, I’ll spend a few minutes reflecting on 1) the Carly Project, and 2) ITC projects that I’d like to see happen. Then I’ll forget them both, try to clear my mind completely of worldly thoughts, and connect with God using a heart meditation… resting there in peace and love. I’ll let the light flow where it will during the meditation. Well, this is probably my last article on spiritual matters for the year. My big task now is to round up the big news of the past six months and try to put it all into some kind of spiritual and noble-savage perspective, for an end-of-year news summary. That’s what I’m planning as my next post… probably close to the end of the month. This entry was posted in After we die, Spiritual realms and tagged afterlife, astral world, choosing a spiritual path, heaven and hell, Myers spirit model, spirit influences on people. Bookmark the permalink. 12 Responses to ITC… or Magic… or God… What Spiritual Path Is for Me? Beautiful descriptions; I really find this entry valuable, a particularly relevant framing of what is around and within us. Looking forward to more, for sure……….. Thanks Mark for this enlightening post. When I was only around 5 years old I wanted to go back to where I came from because I didn’t feel like I belonged here on earth. I still feel that way. Please stay on this course. I believe that I am homesick for God and the heavenly re-helms & organized religions isn’t the key. ITC is a great path to ONENESS. That’s interesting, Joy. I wonder how many other people feel out of place on Earth because of their strong spiritual connections. Hey Mark. Thanks for the enlightening information. Really enjoy this site. I was wondering if you feel that we make pre-birth contracts ,before we incarnate each time, to learn or have certain experiences? Hope you are feeling better. I don’t recall any ITC contacts referring to soul agreements or pre-birth contracts for people preparing for a lifetime on Earth. I’ve read other esoteric materials, though, and the general consensus is that many people-in-spirit, preparing for their next incarnation, do make certain agreements between their higher selves and their guides, about what they hope to achieve in their next lifetime. And yes, I do feel that that is the case for many people, if not for most people coming into this world for a lifetime. We sign up for certain things that we may have overlooked in past lifetimes. I’ve been reading Allan Kardec’s books on spirits and mediumship lately, and they reinforce what I’ve read in other places over the years, that when we undertake the task of spiritual growth or working with spirits, our motivation and commitment to doing God’s Will are essential, so are constantly being tested, both to help us recognise and identify any weak spots (whichy we all have), and to strengthen our resolve. I have found that whenever I am about to, or in the process of making a significant leap, I fall ill with flu, a really bad flu. I’ve always seen it as bringing me back to the ground where I must build or strengthen my foundation – physically, mentally and spiritually, and also as a cleansing. I emerge feeling immensely lighter and ‘more spiritually oriented’ (I don’t know how else to describe it) than before, so much so that I emerge from these flu with a profound sense of joy and gratitude. Just today, I was reading in Kardec’s The Spirit Book that lower level spirits, even those whose intentions are to deceive and distract, are allowed to work on us as part of that testing ,and to alert us to our weaknesses or vulnerabilities, or strengthen our determination. “It is only the weakness, carelessness, or pride of men [and women] that gives strength to bad spirits; their power over you comes solely from your not opposing sufficient resistance to their action”. And in times of uncertainty or confusion, communicate with your brother or sister spirits. “Do not fear to weary us with your questions. Remain, on contrary, always in connection with us”. The flu connection is fascinating. I do feel cleansed and lightened now that the I’m mostly healthy again. A few weeks ago I mentioned to Carly that I’d ordered a new copy of Spirits’ Book, since I hadn’t read it for more than a decade. Carly said she was also reading it. Small world, great book. During the flu I was thinking of what a light and caring soul and energetic woman Carly is, judging from our conversations and emails. I was wondering what kind of spirit group would allow her to go through such suffering, and why would she be stuck working with such troubled souls on the other side. Then it occurred to me that many people probably wondered the same thing about Mother Theresa: Why would she let herself be immersed in the starvation, poverty and disease of the suffering masses? Might have to do with a calling….. Anyway, you’re probably right, Tosca, about how a brush with darkness might make one more receptive and sensitive to the light. Thanks for the thought-provoking ideas. This might sound like a naive question, Mark, but I must ask, are those little dots of light falling down this website something you put there? No, Tosca, it’s a little gift that wordpress (the website host) adds every Christmas season. Cute. Just wondered. I’m seeing signs all around, so didn’t want to assume.